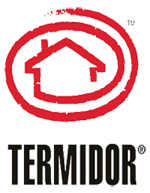 Certified Pest Control is a Termidor Certified Agent - The Best Defense against Termites! Subterranean termites, which build underground nests, can be extremely destructive. They can tunnel to wooden structures (like your home), which damage by using it as a food source. Termidor employs a Unique "Transfer Effect™" to kill termites fast! Please call us at 216-739-0511 if you have any questions about termites, termite inspections or other wood destroying insect inspections. We look forward to serving you!